As the team manager for the Ranchos DET Team I have the opportunity to share in the challenges and successes of cyclists who ride at the top tier of amateur racing. One of the Riders I work with now is Bryan Larsen. He started out the year as a category 2 and has recently gotten his upgrade to category 1. Category 1 is the top of the amateur ranks. Bryan is a full time student and getting his upgrade has taken lots of hard work, focus, and balance. Bryan was recently invited to participate at the Sacramento Gran Prix as part of a Composite Team. 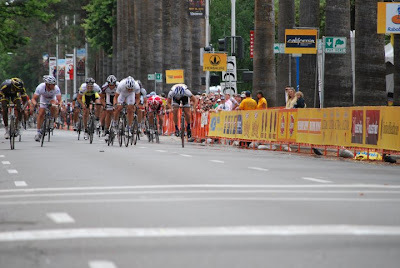 Below is a race report of the Sacramento Gran Prix. 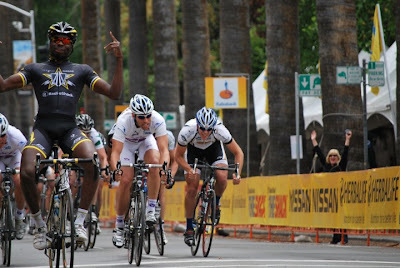 The Sacramento Gran Prix was a Pro-Am event held on may 16th 2010 the same day the Tour of California finished in Sacramento. Hometown. Hometown crowds and friends. Same Course as the Tour of California circuit. And Money. What other reason do you need to be motivated, nervous, and excited all at the same time? And I think nervous was an understatement, as I was more nervous before this race than I had been since national championships back in 2008. My nervousness was only amplified by my crash last week at the Long Beach Grand Prix while still in contention for a descent place. 50m in: Crash. 1 lap+50m in: crash. 2 laps: crash. Etc etc etc No joke, There was a crash at the start. And while receiving a free lap the rider(s) proceeded to take down half the 170 racer group moving at 34mph on the following lap while trying to reintegrate themselves into the pack. They ended up giving about half the pack a free lap and let them start riding prior to the front end of the groups arrival at the pit, which means I went from about 15th place to 85th place in a second. With about 8 laps to go a two place prime was announced and I wasn’t super far from the front so I decided I might give it a go and just start late and not dig too deep. I did start late and by the time I was starting to sprint Justin Williams was basically crossing the line while I rolled in securely in 2nd. We cruised back into the pack only to see lap cards one lap later. I got real nervous when I saw this for two reasons: 1) I had just done a sprint and only had 6 laps to recover now and 2) MORE CRASHES. Everyone thought they could win the race and were doing stupid things to try and get to the front which in turn only caused more pileups. A break went up the road with about 3 laps to go with Yahoo blocking for their rider in the break. The break was caught and Yahoo decided to do a Bahati style lead out while riding the inside straight before flicking riders to swing wide right before the turns before swinging back to the inside line. Coming on two laps to go, there was MAJOR crash in the last corner. It happened relatively close to the front and I could hear it not too far behind me. The following lap we were coming into those dangerous corners, 3 and 4 and the moto decided to try and neutralize the race but Yahoo and everyone else essentially went around him. There was no way we were being neutralized with 1.25 laps to go. People were still sprawled out on the pavement in corner 4 from the previous lap’s crash. 1 lap to go. And I’m sitting about 20th. WAY TOO FAR BACK! Crash again while a group of riders were pinched through a corner. Next corner: CRASH! 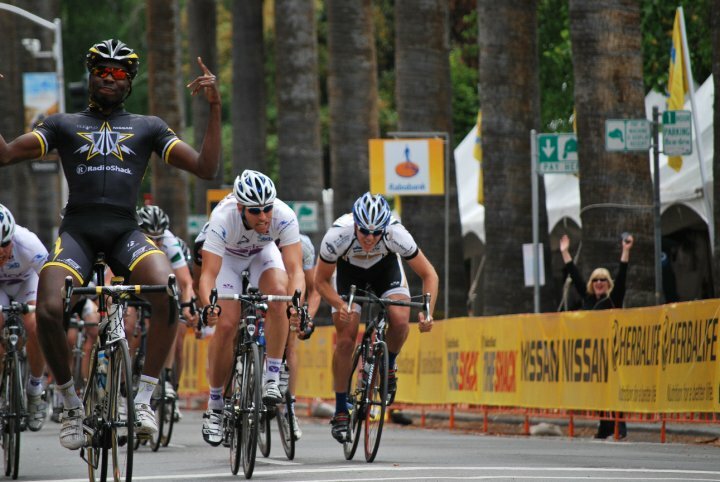 Everyone wanted what only one person can have and that was a win at the Sacramento Grand Prix. I found myself flying into the last corner under Justin with a little heads up on my part he didn’t pinch me and as a result I let him role by me immediately following the turn. 500M to go. I’m 7th-ish wheel and glued to Justin Williams’ wheel. Yahoo was still at the front driving as hard as they could and I was out of the saddle almost immediately and before I knew it I was pinched by a Yahoo guy and forced me into the wind to the left of the rest of the leadout train which happened to be right when Justin jumped forcing me to lose out on that valuable accelerating draft. I had to push my own wind and continued to do so. I crossed the line 4th within ¼ of a wheels length from 3rd. I’m glad I stayed upright, in fact if you had asked me 5 laps into the race how I’d finish I would have said I was going to go down. Another note: I think I heard there were 5 or so crashes in the last 3 laps! At the rate Bryan is going he will be in the professional ranks soon. Good job Bryan keep it up!